Most people don’t realize how much they use their shoulder. . .until, they experience symptoms associated shoulder arthritis. Shoulder pain, swelling and weakness can be aggravating, annoying and limiting. Thus, it’s important that patients know what treatment options are available and effective. Corticosteroid injections are a non-surgical treatment option that can provide fast acting, long-term symptom relief. Corticosteroids, commonly referred to as just “steroids”, are synthetic medications that reduce inflammation. Due to their use across multiple medical disciplines, cortisone and prednisone are two common corticosteroids that patients are aware of. Corticosteroids can be injected into the shoulder joint or surrounding tissues, muscles and tendons. Because the medications can be administered directly to the injured or arthritic area, they are able to quickly and effectively reduce inflammation, pain and swelling. These corticosteroids work by mimicking a naturally occurring chemical in the body called “cortisol”. Cortisol triggers a response by the body and immune system to reduce swelling in the injured area. Results following injections are always individualized. The severity of the injury/arthritis is a key determining factor. Some patients report immediate, lasting symptom relief after one injection. Others may need two or more—which can be administered in three-month increments. Orthopedic surgeons are trained medical professionals who can properly administer corticosteroid injections. The procedure is short—usually less than a minute—and is performed in an examination room. After the injection, patients are able to go home with minimal to no pain, swelling and/or bruising. 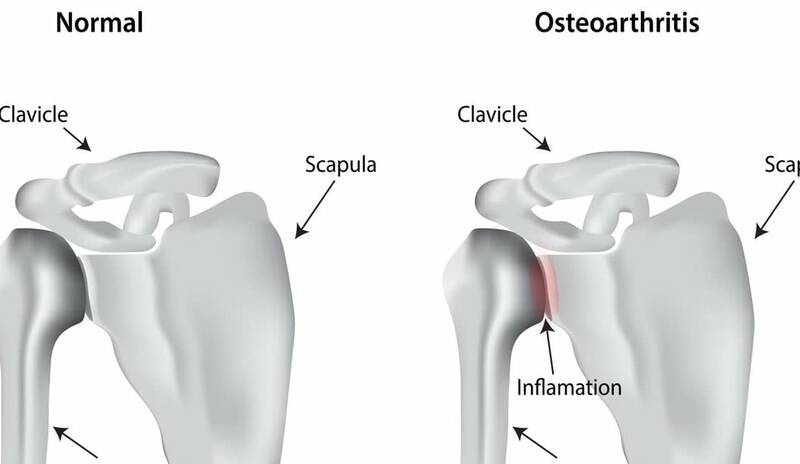 If you’ve sustained a shoulder injury or are experienced any of the symptoms of shoulder injury or arthritis, please feel free to contact our office to arrange an appointment with one of our orthopedic specialists. High Mountain Orthopedics specializes in bone, joint and muscle injuries- including shoulder arthritis. Dr. William Matarese Dr. Tony Wanich and Dr. Sherwin Su have over 25 years of combined experienced treating orthopedic and sports injuries. Our practice uses a multi-disciplinary approach that includes physical therapy and activity modification. If surgery is necessary, our team utilizes the latest advancements in Minimally Invasive and Arthroscopic procedures to expedite the healing process. If you are suffering from a bone, joint or muscle injury – contact our offices today! We have locations in Wayne, Clifton and Englewood, NJ.